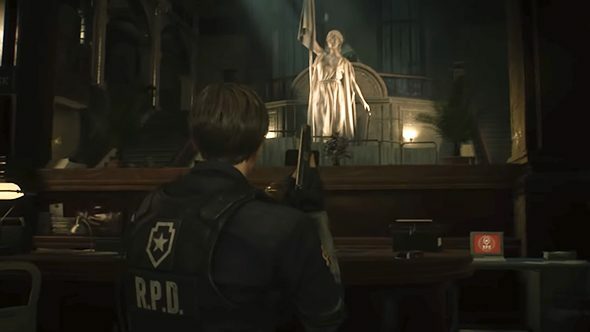 The long-awaited Resident Evil 2 remake made a stunning (and grisly) debut at Sony’s E3 press conference, though the reveal may have provided a few more questions than answer. It looked fantastic, but how does it play? And, importantly, what perspective is it played in? Turns out that the new RE2 plays a lot like RE4, with a third-person over-the-shoulder perspective. You zoom in and aim to fire, but this doesn’t lock Leon’s feet in place – you can still move around and reposition yourself while aiming, although you won’t move nearly as fast while your weapon is drawn. Videogame horror doesn’t get much more iconic than RE2, but be sure to check out all the best zombie games on PC. The remake is built in the Resident Evil 7 engine, and certain elements – from the HUD design to the impressive lighting effects – look very similar to that game, though now viewed from third-person. While it’s obviously not the fixed-perspective tank controls of classic RE, dropping the first-person viewpoint should make this one seem a bit more familiar to series veterans. You can watch that reveal trailer again below, or check out Capcom’s Twitch channel for a fairly in-depth gameplay demo (starting at roughly 25:00), showcasing weapons, dismemberment, and much more.